If you’ve chosen the perfect crossbow for yourself, that’s great, but you also need to invest in the component that will actually be making contact with the target of choice. Having the crossbow itself can only take you so far, since crossbow bolts are essential when it comes to operating a crossbow for hunting or target practice. There are many types of crossbow bolts out on the market and this article will cover a few to help narrow your options down a bit. Barnett Outdoors Carbon Bolts 20"
Crossbow bolts, also known as quarrels, are the arrows that you use when shooting with a crossbow. They typically have a square head, which is where the name “quarrel” comes from, since that is derived from the French word carré, which is then translated to square. Crossbow bolts come in different lengths but are usually shorter than your traditional arrows. This type of crossbow projectile can be referred to as a bolt or an arrow, and you may hear people call them by either name. However, the word “bolt” is only used when referring to a crossbow, not your typical bow. Bolts consist of the shaft, the nock, fletchings, and the bolt head. How Old Do You Have To Be To Buy Crossbow Bolts? In the United States, you have to be of the legal age of 18 to be able to purchase crossbow bolts. Weapons that are able to have a projectile velocity of under 500 FPS are allowed to be owned by any individual who meets the required age of 18. Proper archery permits must be attained if they are to be used during the hunting season and be sure to look into the laws regarding each state, because some have stricter rules than others. For example, crossbow use is illegal in the state of Oregon, whereas seasonal use differs for other states. Since there are so many different types of crossbow bolts on the market, it may be difficult to know where to start. There are many types to purchase, but it’s important to keep in mind what you want to get out of a crossbow bolt, and how it will affect your ability to use the crossbow. There are many materials a crossbow bolt can be made out of, and this is something you’ll want to take into consideration. The most common materials that they can be made out of include carbon fiber, aluminum, and fiberglass. Carbon fiber is a pretty high-quality material that is tough, so it won’t bend easily, and it’s pretty easy to maintain. Aluminum is usually the cheapest bolt material on the market so you can purchase a good amount if you’d like to have more on hand. They aren’t very sturdy compared to the carbon fiber though, and tend to bend more easily which will render them useless. Fiberglass is a material that is able to naturally bend, so it absorbs the impact, won’t harm the bolt, and it isn’t as expensive as carbon fiber, making it a good in-between material. There are many different bolt lengths to choose from, usually ranging from 16 to 22 inches. It is best to go with a length that works well with the crossbow you have on hand, making sure it isn’t excessively long or too short. If they end up being too long or too short, then the efficiency and accuracy of your crossbow lower, leading to a poorer hunting or target practice experience. It’s essential that a bolt that has enough weight to it so that it can hit the target with sufficient energy and force. Materials such as plastic are relatively light and won’t be very useful for a target at a further distance. A heavier material, such as carbon or aluminum, is able to produce a higher level of kinetic energy due to their heavier weight, so they can hit a target with more force at a greater distance. They also move with less speed due to their heavier weight, making less sound and vibrations during a hunt. With so many different types of crossbow bolts out on the market, it may be a bit overwhelming trying to find the best type for your next hunt. To make your decision a bit easier, we’ve compiled a list of what we think are a few of the best bolts that you should consider. These bolts come in a set of six, which is great so you can have multiples of the same bolt on hand. Capture nocks and inserts are installed, providing easier use and enabling these bolts to make a smoother connection to the crossbow. Each bolt is fletched with three-inch vanes as well, which can help with grip. These bolts work well with any crossbow that reaches up to 175 pounds and they are 20 inches in length. Able to shoot accurately and fly straight, these make for a good addition to your crossbow experience. For the quantity of six of these crossbow bolts, the price is pretty decent, and they make for good practice bolts since they come in a pack. The structure and feathering of the bolts are durable so you won’t have to worry about replacing them right away. Overall, this is a pretty good item to invest in, since you get six crossbow bolts that are of good quality, for a pretty decent price. They feature capture nocks and each bolt is fletched with three-inch vanes, allowing it to provide engagement of the arrow to the crossbow. They are lightweight and fly straight, allowing you to make an accurate shot, whether it’s for target practice or an actual hunting trip. With the accuracy, durability, price, and quantity of these, they are worth investing in for both new and experienced hunters and crossbow enthusiasts. These bolts come in a pack of five and feature a dual spine forward weight, diamond weave, and Bufftuff. There are two spines for each arrow, which allows the structure and design to manage energy more efficiently and allows the bolts to recover faster after each use. This design also helps them retain their speed and deliver more accuracy. The back section is constructed out of Carbon Express’s flagship Diamond Weave. The carbon material provides more structure to the bolt and ensures that it is stiff and has a durable spine consistency. These bolts are fletched with three-inch fusion vanes, 403 grains, and are 22 inches in length. The exterior has a precision-milled insert that adds to the strength and consistency of each individual bolt. For a bundle of five crossbow bolts all at a good price, this is a product that could be worth investing in. The Carbon Express diamond weave provides a sturdy structure that won’t easily bend, even after multiple uses and successful shots. They do not come with field tips, but other features are still able to make this a great product. The exterior has a precision-milled insert for added strength, and each piece is fletched with three-inch fusion vanes which add to the stabilization of the crossbow while it is flying, ensuring you have a straight shot. These crossbow bolts have an overall weight of 325 grains, allowing them to retain energy more efficiently and to provide terminal performance. Being able to choose a field point or broadhead weight allows you to open up your options and find what works best for you and your hunting preference. These bolts come in a pack of six, making them a great deal, so you’re able to have multiple on hand if you need to take more than one shot at a time. They are 20 inches in length and work great with crossbows of 150 pounds or so on average. They are very accurate, offering 0.003 straightness with each use. These bolts have a solid structure and are able to cleanly pass through a target while exiting through the other side, without bending or damaging the shaft of the bolts. Overall, this is a great deal, getting six crossbow bolts for a decent price. The fletchings may become loose after a few uses, but the overall quality of the other parts is good. They have an overall weight of 325 grains, making them good to use with crossbows of 150 pounds on average, and they are able to properly and efficiently distribute energy and provide good and consistent performance. These are very accurate, having a capability of 0.003 straightness so you are ensured direct impact with the target of choice. The solid and durable design of the bolts allow them to pass through a target while maintaining their straight build, so you can use them multiple times without worry. This is a great set worth investing in. These crossbow bolts come in a pack of six and include launchpad precision nocks that allow them to deliver a controlled arrow release so each shot remains accurate and unaltered. These also have great shaft alignment when set up in a crossbow, which allows for consistency for each shot taken. The carbon material construction of the dynamic spine of each arrow helps make the broadheads fly better and helps control arrow flex so they are more resistant to bends and breaks. Straightness is checked to an impressive 1/10,000 of an inch, so each shot is more likely to make it to the desired target. The red color makes it easier to spot your bolts as well, if you need to gather them after shooting, or if they pass through the target and lodge into the surrounding area. These are great crossbow bolts, coming in at a great price and in a pack of six, with a nice and visible color. 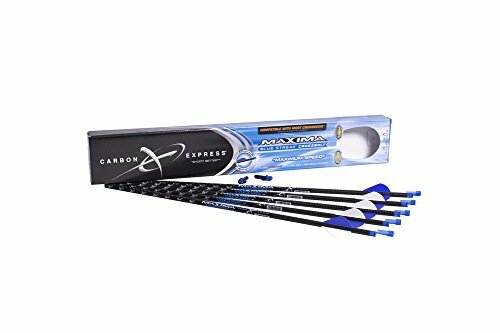 Carbon material allows them to fly well in the air and helps control the flex of each arrow so they are more resistant to bends and breakage upon impact. Each bolt flies very straight and is able to consistently land in the desired location. Launchpad precision locks help deliver a controlled arrow release so each shot remains unaltered and is able to effectively distribute energy once the target is hit. This set of five crossbow arrows are 20 inches in length and feature field points. 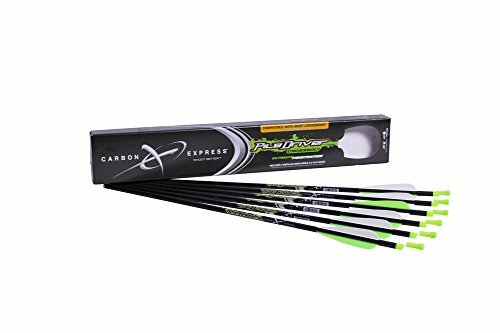 These arrows are about one ounce in weight and they feature lightweight, strong, and durable carbon shafts that help prevent breakage and bending upon impact. There are 13.78 grains per inch with a 100-grain point, giving them great accuracy and penetration of the target. They shoot straight and are able to properly hit a target, and if they exit from the other side of said target, the structure of the arrow is strong enough to withstand the impact, so you are able to use them multiple times without worry. Overall, this is a great set of five crossbow bolts, able to shoot straight and accurately at any target. The fletchings are durable, but if they’re shot through a particularly sturdy target, they may become loose. Since there are five in this pack though, you can cycle through the others so they all experience the same use, making each last longer. 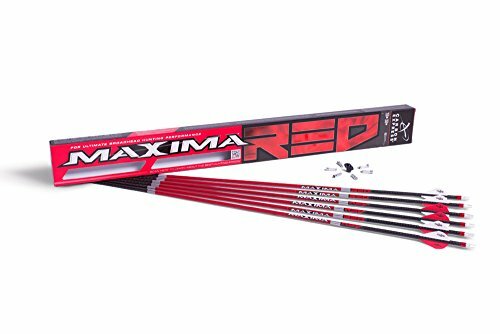 These are lightweight and durable arrows, and 13.78 grains per inch allows them to penetrate the target with great accuracy. These bolts are made from carbon fiber and glass fiber, combining the characteristics of each material and allowing them to be strong and resistant to strong forces upon an impact that may cause them to break. They are more stable than those made of other materials and they have low shock qualities so energy is efficiently transferred upon impact. These arrow tips are able to be replaced and the tips that come in this set are made from automatic steel so they can go through a target. These bolts are in a set of twelve, making them great to rotate through in order to allow them to get equal use so they can last longer. The amount also works great so you won’t have to worry about replacing them any time soon. This is a great product to invest in where you get twelve quality crossbow bolts at a really great price. Since you’ll have a lot on hand, it would be a good idea to cycle through them to get the most use out of them, without putting too much use on one at a time. The carbon allows them to extend their durability and the replaceable tips allow you to get more usage out of the durable shafts. These crossbow bolts come in a pack of six and feature dual spine weights that allow them to manage energy transfer better, so they can recover faster and be ready to be used again. They are able to retain more speed and deliver great accuracy to the desired target. The carbon weave design adds to the precision of each bolt and allows for increased strength and accuracy. They are fletched with three-inch fusion vanes, are 22 inches in length, and weigh 416 grains. The mossy oak treestand camo design makes them great for camouflage, though they may be harder to spot when you need to collect them. 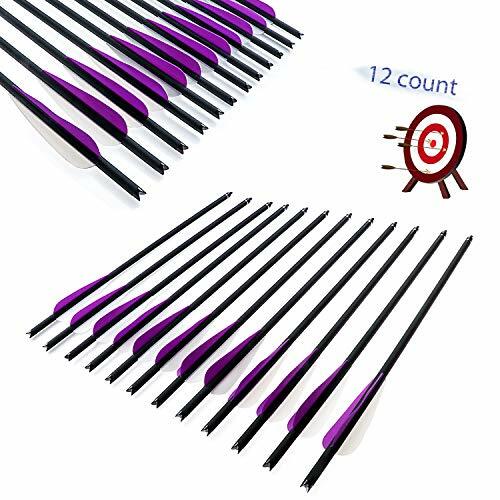 These are pretty high-quality arrows and though they can be more expensive than the previous items on the list, they are worth the price due to the quality. 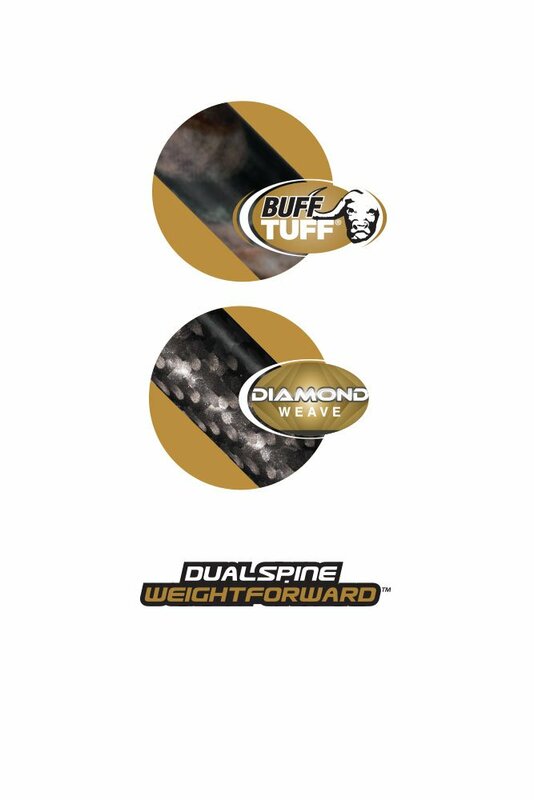 One thing that is noticeable is that in the image online, the vanes are blazer vanes, while the actual product that arrives is much longer vanes. Other than that, the carbon material provides great structural support to these bolts and allows them to deal with impact and manage energy well. These carbon express crossbow bolts are 22 inches in length and come in a pack of six bolts. The heavy grain weight of these bolts allows them to increase their kinetic energy and have stronger power upon impact. They are able to hit a target harder, this allows the bolts to penetrate the target easier. The construction of the spine ensures greater accuracy and makes them more durable during impact so you won’t have to worry about breakage or any bending. These are fletched with four-inch panes and have six universal flat nocks. You can easily rely on these, as they are able to repeat their great performance again and again. These bolts are able to penetrate even the toughest of targets and are able to hit hard. They do not include field points though, which can be a downside. The spine construction helps make for greater accuracy and durability of these bolts, so they are able to be put through repeatable use while still maintaining good performance. Heavy-hitting bolts that are able to be held in a tight group makes these very much worth investing in, especially if your targets are large. You may wonder what you’ll get out of purchasing higher-end bolts. Higher-end doesn’t necessarily relate to price, as a great set of bolts can be lower in price. What makes them great is the quality they are able to bring to the table. Great bolts will be durable in build and be able to last through multiple uses while still being able to perform like the day you first bought them. Durability is often based on the material they are made of, and carbon fiber makes for great material. If your bolts break after just the second use, they really aren’t the best quality and you should think of investing in a different product. The performance of a bolt is important, whether it is able to fly straight or properly hit a target. Great bolts will be able to have great accuracy and strong impact, and they should be able to sit properly in the crossbow and release cleanly. They should also be of a comfortable weight and should make minimal noise upon release. For a great set of bolts, energy management is important because it determines if they will bend or break upon impact. Kinetic energy is what is created as it is released and once it experiences impact, the energy has to go somewhere. Great bolts are able to efficiently and effectively manage energy once they hit a target, so no matter the target, they won’t bend or break once they make contact. There are many things that should be considered before you purchase a set of crossbow bolts, such as the quality, how many you want, how heavy you’d like them to be, and so forth. Quality products will be comfortable to use with the crossbow you have on hand, able to retain their durability even with repeated use, and they should be able to manage energy well so they don’t break or bend. It is a good idea to get a set of bolts so you can rotate them out and not use one constantly, allowing them all to get equal use so they don’t become strained. The bolt is just as important as the crossbow and they must be able to work together in perfect unison. “Da, well the crossbow ain’t archery `quipment cause it shoots bolts, not arrows!” claims the anti-crossbow expert. Jeez, I hate it when I hear that statement! I would like to put forward some simple information to clear up this murky subject, once and for all. 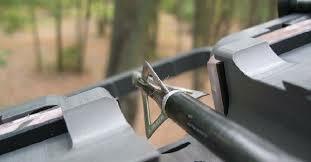 The modern hunting crossbow does not shoot bolts, it shoots ARROWS! If a projectile has a guidance system in the form of feathers or vanes on the end of it, it is an ARROW! Can we say the word “ARROW” boys and girls? Crossbows shoot ARROWS! You can argue, rationalize and fantasize, but the fact remains – IT IS AN ARROW! The crossbow bolt is a short dowel-type projectile that was once used for indoor and outdoor target shooting. It is seldom, if ever used in the twenty-eighth (or so) century of crossbow shooting. Now is time for crossbow shooters, arrow and crossbow manufacturers and even those opposed to the existence of crossbows to all crawl onto the very same page and come to the realization that the crossbow shoots arrows, not bolts. Target bolt shot during International Match competition resembles a mechanic’s bolt in some ways, including light treading on the tip. The string end of the bolt, above is notched to insure exact bolt alignment. Those who scorn our weapon of choice claim that we shoot bolts because they are shorter than those shot from vertical archery equipment. Okay, let me get this straight, if that is the definition of a bolt in their superior little minds, then archers that shoot short arrows from an over-draw are shooting bolts, right? I dare say that if you walked up to a vertical archer who is using short arrows with an over-draw system and say, “Hey Dude, really good looking bolts you are shooting there!” there would be hell to pay. How about going to a junior archery league where youngsters are using 18-inch youth arrows? Give those kids on the shooting line the all clear and then tell them they can go pull their bolts out of the targets. Even a newbie child knows that they are shooting arrows and not bolts and they will, in no uncertain terms, let you know that you do not have a clue as to what you are talking about. Why then, do some of us as mature adults insist on calling our arrows, bolts? I understand that a lot of folks just do not know any better. It is a simple matter of knowledge washing away the ignorance. Well, if you are reading this article, then you can no longer plead ignorance! Start calling your projectiles what they are, ARROWS! If you are shooting something similar to the photographs included with this article, you are shooting bolts. If you are hunting with this type of projectile, you should seriously consider taking up another sport, because “you ain’t right”! However, if you are hunting with a 20 to 24 inch projectile with feathers or vanes at the nock end, you are shooting an arrow. Get used to the fact and call them what they are. If you are an arrow manufacturer and you are manufacturing and selling projectiles for crossbows, please take note. If those projectiles look like the photographs in this article, you are indeed manufacturing and marketing bolts. In that case, please feel free to call them bolts. However, if you are manufacturing projectiles that look like arrows, complete with vanes or feathers on the nock end, then you are manufacturing ARROWS. For Heaven's sake, please call them ARROWS, because that is what they are. It is time to end the arrow/bolt confusion, people. Crossbow hunters shoot arrows, not bolts. I have heard it said that it doesn’t really make any difference what you call them. Excuse me? I have also heard it said that a whitetail buck has nice horns, you know what I mean? NO! A buck has ANTLERS; cows and automobiles have horns. I got a bunch of polecats under my barn, you know what I mean? NO! You have a bunch of SKUNKS under your barn! Polecats live in Europe and Asia. Boy there sure is a good crop of akerns, this year, you know what I mean? NO! There is a good crop of ACORNS this year! There is no such thing as an akern! My crossbow sure does shoot a bolt fast, you know what I mean? NO! Your crossbow shoots an ARROW fast, not a bolt. A bolt is a short featherless dowel like projectile once used for target practice at indoor and outdoor ranges. Just because a lot of folks choose, for whatever reason, to mislabel something, it doesn’t make it right, you know what I mean? So….Let’s all, shooters AND manufacturers, get in the practice of properly addressing our projectiles for what the really are – ARROWS! NOW SAY AMEN!